Donald Trump remains the dominant figure in the Republican presidential race. The latest Quinnipiac University Poll puts him at 28 percent support among Republican voters with Texas Senator Ted Cruz closing in at 24 percent. Florida Senator Marco Rubio, who has made national security a centerpiece of his campaign, is third with 12 percent, followed by Dr. Ben Carson with 10 percent. The survey also found, however, that 50 percent of those surveyed — including both Republicans and Democrats — would be embarrassed to have Trump as president. 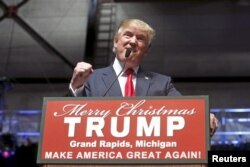 U.S. Republican presidential candidate Donald Trump addresses the crowd during a campaign rally in Grand Rapids, Michigan, Dec. 21, 2015. During the recent Republican debate in Las Vegas, rival Jeb Bush described Trump as the “chaos candidate” and questioned whether Trump was ready to lead. South Carolina Senator Lindsey Graham was perhaps the foremost national security candidate in the Republican field. Graham set himself apart by announcing that if elected he would send thousands of U.S. troops back into Iraq and into Syria to combat Islamic State fighters. Graham ended his presidential campaign this week, though, never able to move beyond about one-percent support in the polls. Bernie Sanders, left, listens as Hillary Clinton speaks during a Democratic presidential primary debate at Saint Anselm College in Manchester, N.H., Dec. 19, 2015. This new emphasis on security also appears to have helped Democratic frontrunner Hillary Clinton widen her lead over rival Bernie Sanders. He has drawn support from progressive Democrats for his crusade over income inequality. His poll numbers have dropped in recent weeks, however, as Democratic voters took note of the recent terror attacks and focus on national security. Clinton wants to intensify the military campaign against Islamic State fighters by stepping up the air campaign and by forming an international coalition to confront the jihadists on the ground. But Clinton also seems to be looking ahead to the general election campaign by going after some of the Republican contenders on national security, including Cruz who vowed to “carpet bomb” the Middle East to defeat the Islamic State group. “Promising to carpet-bomb until the desert glows doesn’t make you sound strong. It makes you sound like you are in over your head,” Clinton said in a recent national security speech in Minneapolis. The focus on terrorism and security should help Clinton in the Democratic primaries. Analyst John Fortier of the Bipartisan Policy Center in Washington warned that the laser-like focus of Republican contenders on what they see as the foreign policy failures of President Barack Obama could be a liability in the general election. “The president’s [poll] numbers have really gone down on foreign policy. He is seen, especially on terrorism, but broadly on foreign policy, as being weaker," said Fortier. Obama has taken note of the Republican barrage and has sought to reassure voters his administration remains committed to taking the fight to ISIL, a term he uses to describe the Islamic State group. “We are hitting ISIL harder than ever in Syria and Iraq. We are taking out their leaders and our partners on the ground are fighting to push ISIL back, and ISIL has been losing territory,” the president said last week after a visit to the National Counterterrorism Center in Virginia outside Washington. What’s clear from the last few weeks is that world events can have a huge impact on the direction of the U.S. presidential race, adding yet another level of unpredictability to what already has been a most unexpected campaign cycle.